How do I remove a LinkedIn contact? Home / Blog / Blog / Tech Guides / How do I remove a LinkedIn contact? I recently delivered a presentation on building stronger business relationships where I shared with the audience of business men and women my view that Social Media isn’t the numbers game that the majority of us now treat it as. In short, I believe that it’s not about the number of contacts you have, it’s about the depth of relationship you have with your contacts. To that end I talked about making more of your existing LinkedIn connections and being more selective over who you connect with, with a view to fostering a smaller number of better connections. Should you remove LinkedIn contacts who you have no relationship with? After the event a lovely lady called Claire approached me to ask the question “Should you remove LinkedIn contacts who you have no relationship with?”. Claire was referring to those contacts LinkedIn contacts you may have connected with ages ago who you might have met briefly at an event, and who you’ve never had any contact with since. Chances are that if you don’t know who they are, then they certainly don’t know who you are! LinkedIn themselves say that “Connecting to someone on LinkedIn implies you know them well”. In this scenario I don’t see any benefit to retaining connections to contacts we don’t really know. In fact, when a mutual contact on LinkedIn recently asked me to introduce them to somebody I’m already connected to on LinkedIn, I was left red faced when admitting that yes, that person and I may be connected on LinkedIn, but no, I don’t really know them at all and doubt they remember who I am! As a litmus test, ask yourself this question — could you randomly select a LinkedIn contact, call them and for that person to know who you are? If the answer is no, then you probably need to remove some connections until you’d feel more confident about your relationships with the people you’re left connected with. What happens when I remove a LinkedIn connection? 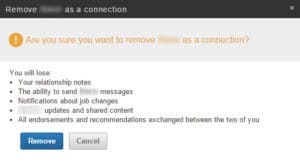 If you do find yourself needing to remove a LinkedIn connection, the first thing to realise is that the connection won’t be notified that you’ve removed them. This might be important to you if you’re removing a LinkedIn connection because of a personal situation, or you don’t want to be associated with that individual any more. For those LinkedIn contacts you are removing because you don’t know who they are, then rest assured that that feeling of “Who is that?” is probably mutual and the other person probably doesn’t even know you were both connected on LinkedIn any way! If the contact ever does realise that you have removed them and asks you about it then I would up front and say you were recently bulk removing old connections that you’ve not spoken to in a while and that you’d be delighted to reconnect if they wanted to. Log in to LinkedIn and click the top menu “Connections”. Find the connection you want to remove by using the search box. At the top section of the contacts LinkedIn profile page, click the drop down menu next to the “Send a message” and “Endorse” button and select “Remove connection”. Click “Remove” and the LinkedIn connection will be removed. Removing a connection doesn’t block the person or preclude you from connection to each other again in the future. When I’m asked “Should you remove LinkedIn connections you no longer have a relationship with?” my answer is yes, you should. Those people you are connected with on LinkedIn and who you don’t know any more — or indeed can’t remember why you connected in the first place — those are contacts who have very little value in your network and just add to the noise of social networking. LinkedIn should be for those contacts you either know or want to build a relationship with. If in doubt, remember to ask yourself the question “If I were to randomly telephone any of my LinkedIn connections, would they know who I am?”. The less chance you have of that happening, the stronger your connections are.